Kevin McCarthy and Catch A Star smile their way through a victory gallop after taking 3rd in the $10,000 Futures Prix. 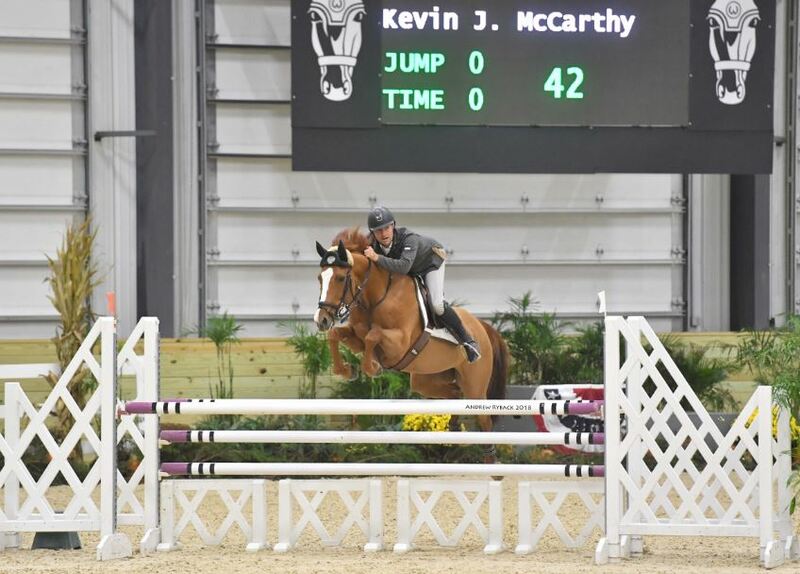 A familiar face around the horse show circuit, Kevin McCarthy has made the transition from professional to back to amateur and has been cleaning up in the Jumper ring. 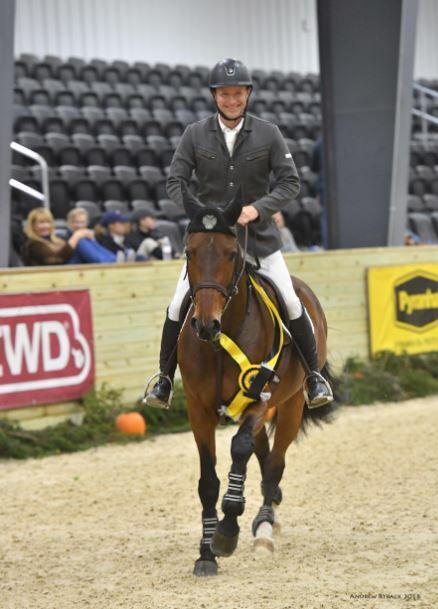 Last week at the World Equestrian Center Invitational McCarthy had many successes with his two mounts, Gwen Mc 1 and Catch A Star, placing in the top three in the vast majority of his entered divisions. McCarthy’s spate of victories began on Wednesday, where he took third out of 19 entries with Catch A Star in the $1,500 1.25 M Jumpers. McCarthy and Catch A Star continued their impressive rounds into Thursday where they jumped the 1.35 m $15,000 Welcome Stake. The pair was double clear, and placed 6th in the class out of 42 entries. The duo earned a top placing in the $10,000 Futures Prix 1.30 m on Friday, again jumping double clear and securing a 3rd place finish out of 36. McCarthy and Catch A Star’s final class of the show was the $7,000 Medium Junior/Amateur Owner Jumper Classic with 15 entries. The pair continued their trend of consistently stellar rounds for another top third place finish. Gwen Mc 1 soars over the purple and white rails with style. McCarthy’s second mount of the week, Gwen Mc 1, an 8-year-old chestnut Irish Sport Horse mare by Quidam, was sure to follow in Catch A Star’s footsteps. On Friday, the pair took 1st out of 19 in the $1,200 Low Junior/Amateur Owner Jumper 1.20m/1.25. The two continued into Saturday, jumping into 3rd place in the $6000 Low Jr/Am Owner Jumper Classic 1.20m/1.25m out of 21. With their incredible rides in the Low Junior/Amateur Owner Jumper 1.20m/1.25m, McCarthy and Gwen Mc 1 ended up securing the Reserve Champion title for the division at the WEC Invitational. It was Kevin’s first time at World Equestrian Center traveling to us from upstate New York. We hope to see him back this Winter!